There are many reasons why you might want to wrap your horse’s leg. And there are different techniques for applying wraps and reasons for wrapping. Here are the most common types of wraps or bandages you'll need to know. In the stall, standing wraps or stable wraps help prevent ‘stocking up’. Stocking up is when fluids settle in the legs because the horse is standing on a hard surface and not moving around to keep the fluid flushed out of the tissues. You many have to secure a wound dressing or poultice if your horse is injured. You may wish to avoid possible stall injuries if your horse is particularly fractious when kept in. If you’re headed for a show, stall wraps can help keep your horse’s legs clean, and if there is a wound, bandages can help keep that clean and protected. Horses can be turned out in wraps. This is to protect the horse from pasture injuries and protect existing injuries. Bandages or wraps used while riding protect a horse from scraping itself on obstacles such as jumps or gymkhana props and provides support when doing high-performance activities such as jumping, barrel racing or other sports that put a lot of strain on a horse’s legs. Polo wraps or exercise bandages may also be used to protect and support the legs while longeing, as the small circle the horse is traveling in can put a lot of stress on the legs. Polos are used for decoration too. My daughter’s drill team made red wraps for their pony's and horse’s legs so help the team look coordinated. You might also see wraps on parade horses. Since polos come in lots of fun colors (and are easy to make) there are lots of decorative choices. The wraps used for shipping (trailering), stable and turn out are longer than polo wraps. Standing or shipping wraps are also applied over ‘cottons’ or thick quilted pads. Polo wraps are used alone. The exact length you must buy will depend on the size of your horse. The lengths of the wraps are usually are designated in pony, horse or large horse sizes, exact measurement by the inch or centimeter or small, medium, long and extra long. Stable bandages are usually about six inches wide. Polos will be narrower and are shorter in length than stable or standing wraps. This is because polos are not applied over padding. Most horses will require medium or horse sized wraps. A pony or small horse with fine bones may need pony sized wraps and if you have a very large boned or draft type horse, you’ll need to get the longest wraps. The good thing about long wraps is that most are easy to shorten with a pair of scissors if they happen to be to long. Older wraps may have shoelace like ties that were tied in a bow. Newer wraps have hook and loop fastener strips. When choosing a set of leg wraps, if you have the choice, get wraps with wider fasteners. Narrow lace ties and fasteners will not distribute the pressure as evenly as wide fasteners. This is important because tight wraps and pressure points can be very damaging to a horse’s legs. 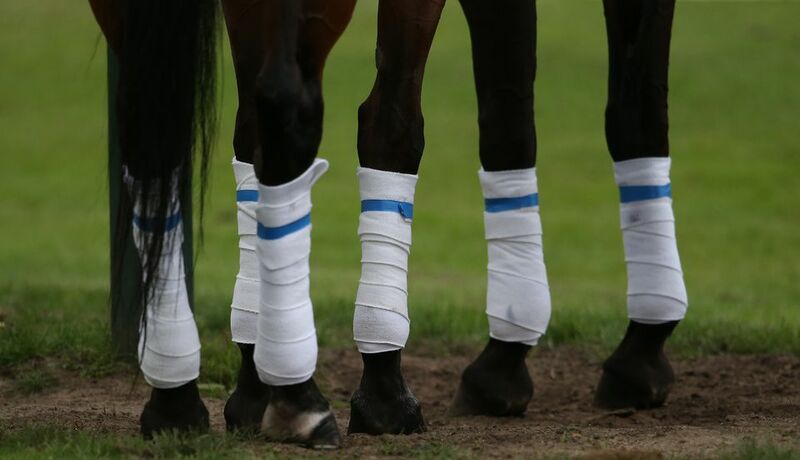 When traveling, wraps or bandages help support and protect your horse’s legs. As horses balance themselves in a truck or trailer, they can easily step on their own or each other’s feet or scrape up against the side or partition of the box. Wraps also help keep the legs clean if you’re traveling to a show. Shipping boots may be easier to put on and take off, but most horse owners agree that bandages actually provide more support than a boot. Stable or standing wraps should be applied over padding or ‘cottons’. Cottons are thick rectangles of quilted fabric. They help distribute the pressure of the wrap. For wound dressing, a material like Animal Lintex or gamgee that you keep in your first aid kit might be used under or instead of the cotton padding. Again, cottons come in different sizes, and you’ll need to match the cotton to your horse’s size. Most cottons and wraps are made with synthetic materials or are a cotton blend. To clean them, you can simply throw them in the washing machine. An extra rinse ensures there is no detergent residue to irritate a horse’s legs. Hang wraps to dry and re-roll for the next use. Put them in the dryer only if you like detangling big knots!